Find and fit the right linen every time! Packs of 4, available in blue/red or green/black. Packs include a key card, with room to assign SizeWay clips. 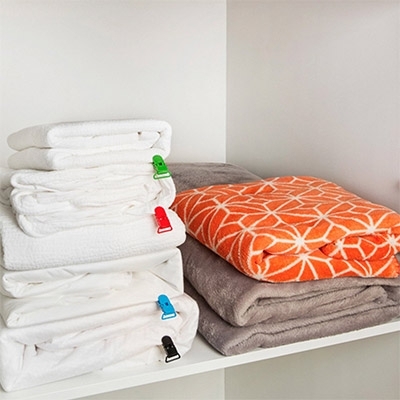 CHOOSE: Choose a clip colour and allocate it to a linen size for easy identification of sizes, eg: Queen Beds = Red. FIT: Fit linen correctly to bed. Open clip, by lifting flap, placing the teeth on the bottom left corner of linen. Close clip. CLIP: Clip it on and leave it on, for wash and wear. Always know the size of your linen, as well as the correct way to fit your sheets on the bed. KEY: Keep the key card, that is included on the packaging, on the inside door of your linen cupboard, for easy identification.